With two scintillating offensive performances, Huntington’s Martavious Young and Canton’s Ryan Brinson share the Conquest Cards Ultimate Indoor Football Offensive Player of the Week honor. It’s the first offensive award for both teams. Young registered for five touchdowns, three passing and two rushing, and became the first UIFL player to record 100 yards rushing. In addition to the five touchdowns, Young accounted for 245 yards – 118 rushing and 127 passing. Brinson, who was signed this week, became the first receiver to record 200 yards receiving. He finished with 10 catches for 204 yards and four touchdowns, including the game-winner with 16 seconds left. Indoor football fans who have had a chance to see Huntington Hammer rookie quarterback Martavious Young have seen him blossom under the freedom that Head Coach Josh Resignalo’s switch to the shotgun formation has given him. With just two games since the change, Young has catapulted to the UIFL’s leading rusher, become the first ever 100 yard rusher in the UIFL and taken the Hammer to the league lead in rushing offense. 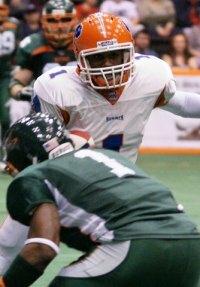 Martavious is now also secured himself a share in Offensive Player of the Week honors in the Ultimate Indoor Football League. This is the second time that a Hammer player has been chosen for a league honor. Young ended the night against the Eastern Kentucky Drillers with 275 total yards, 118 yards and 3 rushing touchdowns plus 2 more passing touchdowns and an additional 127 yards through the air. He was also instrumental in the more than 10 minute advantage in the time of possession that helped the Hammer to the win. The Hammer plays Friday March 25 at the Big Sandy Superstore Arena.